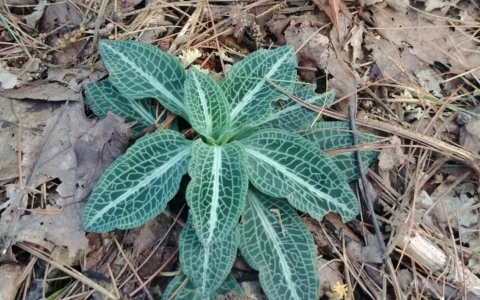 The image above is downy rattlesnake-plantain (Goodyera pubescens). This native, New England orchid had not been seen in the Fells for more than 20 years – until Dennis Crouse and Lindsay Beal re-discovered a small population. Bryan Hamlin, our local expert on the flora of the Fells, says that a previous botanical survey in 1993 reported its presence. But the survey that he and others conducted from 2004-2012 had not been able to relocate it. It is really exciting that it has been re-found after so long! The plants found this year were not blooming. 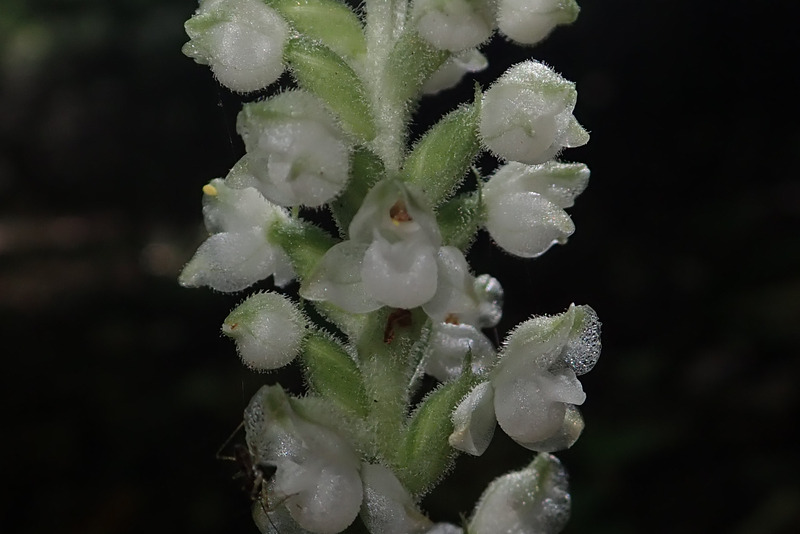 But when this species does flower, it produces a spike of small, white flowers that I find very beautiful. Look at the tiny pouch shape that the flowers make and the fine fuzz of hairs that give it the “downy” part of its common name. The “rattlesnake” part probably comes from the patterns on the leaves which look a bit like snake skin. And “plantain” from the leaves’ similarity to common garden plantain (Plantago major). 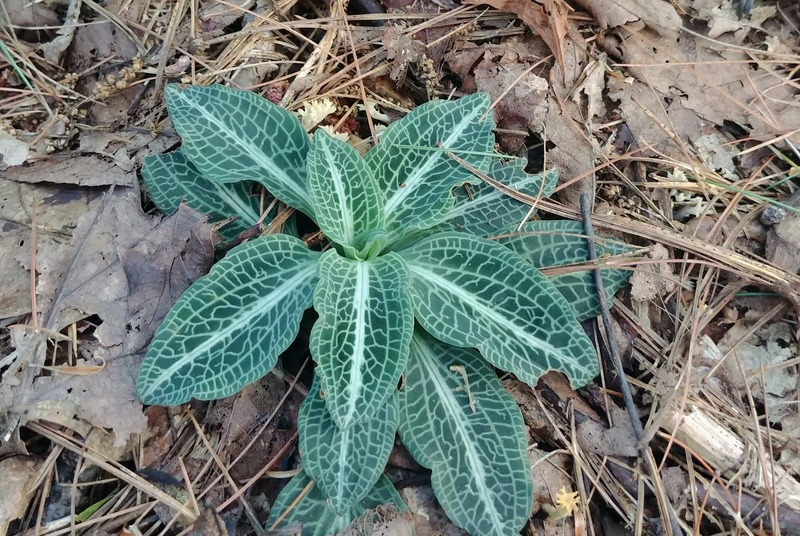 Rattlesnake-plantain flowers in later summer and is pollinated by bees. 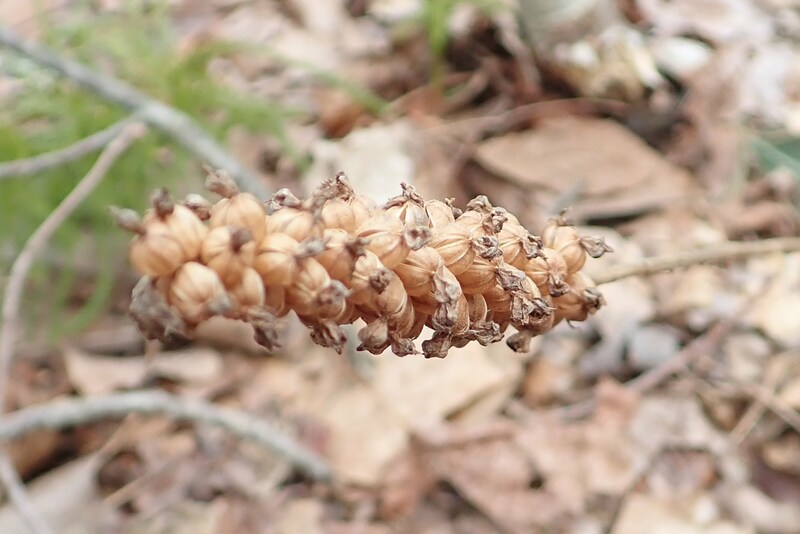 If you find it at other times of the year, look for the dried brown seed capsules that indicate it flowered the previous season. The leaves are evergreen, so it’s a great one to look for in late Fall and early Spring when the ground is mostly brown and its bright green leaves stand out. 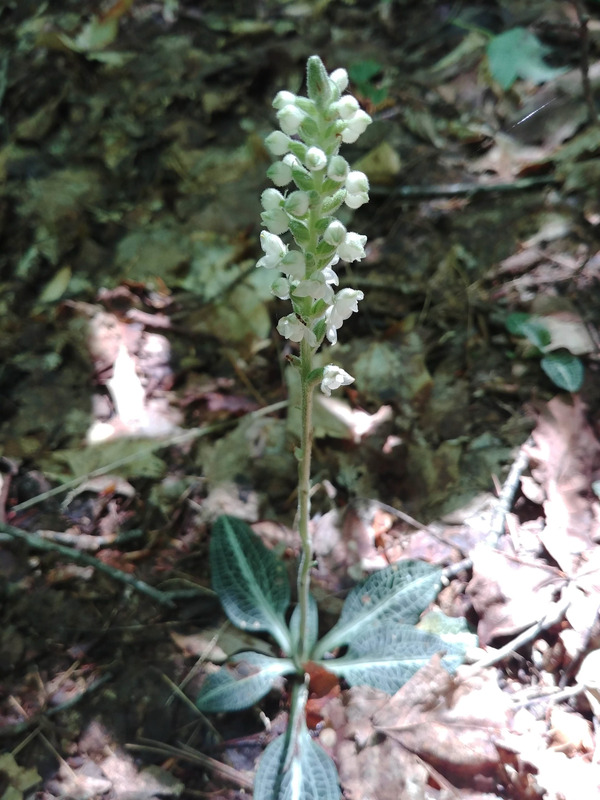 Downy rattlesnake plantain is fairly common in New England. 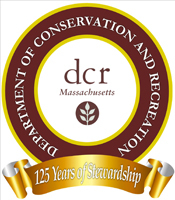 But, like most other local orchids, it is very sensitive to soil conditions and disturbance. If you’re lucky enough to come across this plant in the Fells or elsewhere, be careful not to trample it or disturb the area around it. And if you do find it in the Fells, take a picture and let us know!